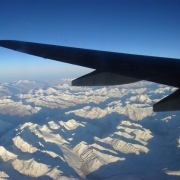 After catching the early morning flight to Leh (11500 ft) from Delhi (777 ft) and by floating over mesmerizing fresh snow peaks of Himalaya and crossing the great ranges with breasting streams you will have your safe landing at high altitude airport of Leh @ Kushok Bakula Rinpochee Airport. A warm welcome awaits you in the Magical Land of Ladakh and our representative will whisk you away to your awesome hotel, rest of the day is spent in acclimatization for your healthier Ladakh trip away from acute altitude sickness. Before kick starting our awesome rides, you first have a proper introduction with team LBR and after that our team will brief the riders about High Altitude Riding for their smoother & memorable trip and by clearing each and every doubt of you & having checklist the requirements of tour we’ll ready for our orientation ride and soon we will kick start our ride to visit some famous monasteries, monuments & viewpoints and by the evening we’ll back to our hotel. 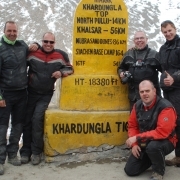 Are you ready to blow away the roads to khardongla(18780 ft.) today ?? After a refreshing breakfast, Ride your machines for a uphill adventure towards Northwards Ladakh, spectacular Landscapes along the roads and climbing through some rough & snaky turns with a thrilling view of Leh town, soon you will hit the height of heights Khardongla (18380 ft.) and to being there is an achievement for every rider and after touching 18380 ft. and not spending much time at that much height we’ll soon roll down in the beauty of wildest dream known as Hundar. Today we venture on the same route till Khalsar village and from there by turning our left indicator our ride goes towards Warila (17,400ft) second pass of our trip. We’ll zip along the Shayok river crossing streams and soon turn right in the picturesque village of Digar & Tangyar with a midst of adventure to reach Warila pass, wind through the mountains and the day sets off in the beautiful village of Sakti. Soon after breakfast it’s time to kick start yours motorcycles. Today our ride goes through the mesmerizing Indus river till up to Mahi Bridge, enroute enjoy the appealing villages along the river side, famous hot springs and beautiful monasteries. 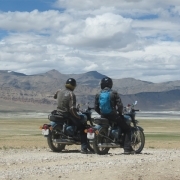 By switching our right indicator we leave the valley to enter the heart of Rupshu, the most isolated part of Ladakh. By taking sandy and rough track with our off riding skill we reach the first most important lake of Ladakh @ Tsomoriri Lake. Explore lake, visit Korzok monastery and look out for high altitude wildlife. Overnight camp along lakeside. With morning sunshine lighten over brackish lake we set our ride for beautifull viewpoint of Tsomoriri lake and by posing some memorable click we trace our route back to Tsokar via Polokonka la pass and after conquering pass we’ll arrive at a beautiful scenic lake called Tsokar (14842 ft), one really feel I had a ride of my life. An awesome blend of stark mountain, gorgeous landscape, occasional sightings of the nomadic people and their herds of yaks & goats are common throughout the route. The Tsokar lake is famous for its migratory birds for bird lovers. With eyes and heart full of so much beauty we get back on the motorcycle for a last day of our ride. After half an hour ride from Tsokar soon we found ourselves riding on Manali-Leh highway and by griping the same route towards Leh soon we’ll touch Tanglangla pass (17,480 ft), the second highest motorable pass and by taking not much time with photography we’ll roll down towards Leh crossing through many beautiful small villages with awesome scenery and by arriving leh we celebrate last night and conclude our tour of Ladakh Camps & Rides. Enjoy a relaxing morning breakfast before catching flight back home and bid adieu to Leh ladakh and team LBR with awesome memories full of adventures. Be enchanted by the Tso Moriri lake one of the highest lakes in the world at 14,840?